Haworth in West Yorkshire is famed for its connection with the Brontes and is a popular tourist destination as a result. Its steeply cobbled main street has many tea rooms and shops, so it was great to spot one place where there is a home with much evidence of the hopes of at least one small child. All the pansies were frozen into submission when I passed by last year, but once the seasonal cold snap stopped they'd soon be springing up again to brighten the stony street . Veg Plotting will resume in the New Year; may you have a wonderful Christmas and New Year, wherever you may be. We've been learning a wonderful new carol at choir and it's great to have one which is about the turning of the year at the time of the winter solstice. I took the above photo to match the words. However, the scene I found at Crewkerne, Somerset on Saturday was quite unexpected - and it looked wrong when I matched the words to it. What a topsy turvy December we're having. Coincidentally, Halsway Manor is also found in Somerset and is the only residential folk centre in the UK. If you thought the solstice was the 21st (which I did), this year it's today at 4.49am instead. Apparently the date can vary between 20th and 23rd December, though the 21st is the most common day. This link tells you a lot more. Every family has its own set of Christmas traditions and it's no different for NAH and me. One of our favourites is the Radio Times (RT) bumper Prize Crossword of 60 or so cryptic clues, which marks the start of our festivities. Puzzles such as this and the RT Trackword are a shared activity we both enjoy. It's a shame they seem to have dropped the Trackword Christmas special; perhaps they've run out of suitable Christmassy phrases for us to puzzle over. Those of you unfamiliar with the Trackword may like to try your hand with this online version I've found whilst writing this post. There's also an App if you're interested. It's amazing to have enough flowers to make a Blooms Day collage, not only that but have enough to leave some of them out! I've noted my current colour scheme is tending towards white, pink and red. 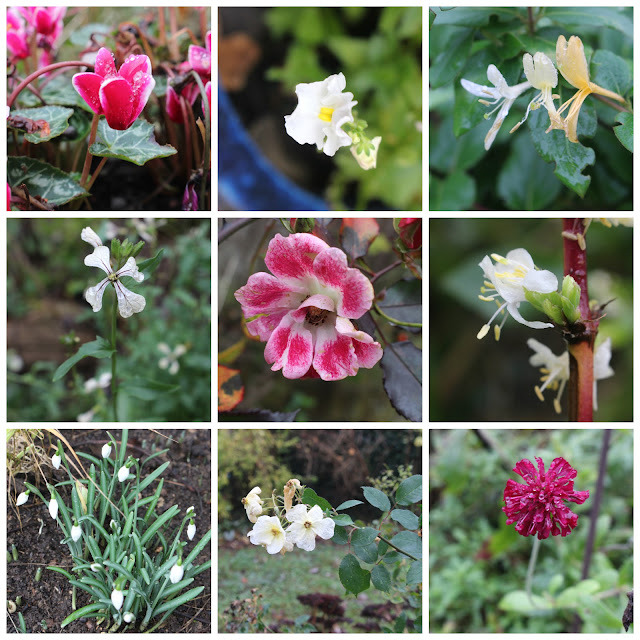 It's an interesting mix of summer and winter flowering blooms and everything looks set for a record breaking garden flower count on Christmas Day. Talking of flower counts, you may like to take part in BSBI's New Year Plant Hunt. This looks at wild and naturalised flowers (not planted or garden escapees) open on one day recorded between New Year's Day and 4th January. All you need to do is go out for three hours and record what you see. Help is available for identification if needed, and tea breaks or comfort stops are allowed! Take the above link to BSBI's website for more information. Grow for Flavour has turned out to be my hit of the year as it's the book I've returned to many times. 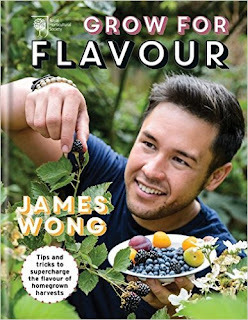 James Wong has extensively searched through thousands of scientific papers and distilled the knowledge gained into this attractive and very readable book. One of the reasons we grow our own is for the freshness and superior flavour our crops brings us. James examines the factors which influence flavour and delivers dozens of handy tips which are easily achievable. It's not all theory and science, James also looked at which varieties do the best in our climate by commandeering some space at RHS Wisley to conduct a flavour trial. So for each popular crop examined you have a number of suggestions to try for yourself. I spent a delightful morning at the Pound Arts centre yesterday making my own Christmas wreath to adorn our front door. I usually fish our willow one out of the attic, but this year I fancied trying something new. Amanda from Daisy Chain in Corsham showed us the ropes, and accompanied by Bing Crosby's 'White Christmas' and plentiful chocolate biscuits to hand, it was the perfect way to get into the festive mood. We started with a wire wreath ring. We fixed a thin wire onto this, then plenty of 'sausage shaped' damp moss with the wire wound around them to form the base and keep the foliage fresh. Then we snipped our greenery into lengths of around six inches. These were gathered into bunches of three and fixed onto the brown moss side of the base. We made sure the ends of the stems were together, so only a couple of turns of the pliant wire were needed to fix them. The foliage faced outwards and in the same direction. Lancelot Brown was nicknamed 'Capability' because he had a habit of telling his clients their estates had a 'great capability' i.e. potential for the kind of sweeping changes which made his fortune. Sadly Capability Brown and his contemporaries swept away many of the gardens which pre-dated their work via the 18th Century's English landscape movement. However, the movement's legacy still has much to be admired. Now 2016 is set to have a 'great capability' as far as garden visits and events are concerned. In addition to the usual suspects, there is the long awaited festival to celebrate the tricentenary of Capability Brown's birth. You can find out which events are happening near you here. Life's been in the doldrums of late, so I'm glad serendipity came to my rescue via my local independent bookshop. I've wanted to learn more about fermented foods such as kefir and kimchi for quite a while, and here was an opportunity to do so (quite literally) served up on a plate. Did I tweet back immediately? You bet I did. Then cheery messages from both the bookshop and the author, set up my anticipation nicely for a good evening. And all this happened before I found out there'd be cake. 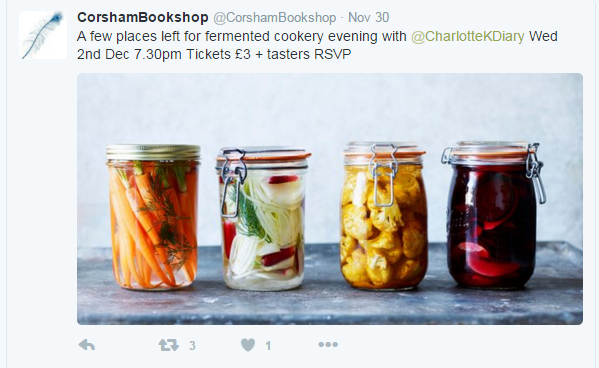 It was so civilised to sit with wineglass in hand and listen to Charlotte Pike explain what her book Fermentedis about. Beforehand I thought I knew nothing, completely forgetting I've made yoghurt and sourdough bread before. There's still lots to learn. For instance the possibility of fermenting fruits and vegetables beyond just sauerkraut opens up a new way of dealing with my allotment gluts. 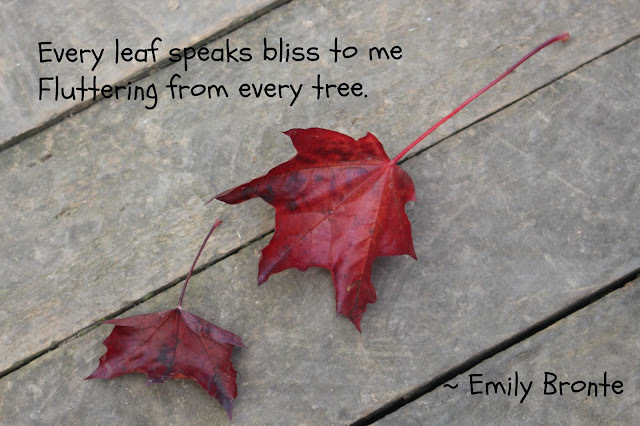 I've been trying to take a decent photo of this quotation for Muse Day for ages and at last, autumn's softer light enabled me to do so. It's given me quite a lot of food for thought over the past few months. When I tell people I write a gardening blog, the most common reaction I get is I must be an expert on gardening. Anyone who gardens knows there is too much to learn in a lifetime, no matter how deeply we might drink from our own 'Pierian Spring'. 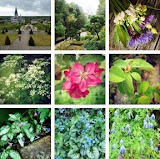 My blog is simply all about what I've learned or thought about gardening along the way. Sometimes the amount left to learn seems overwhelming, and it's tempting to think it might be best not to drink (or blog or garden in this instance) at all. However, as an advocate of lifelong learning, I've decided that would be a shame, and so I must drink deeply for as long as I possibly can. Dee told a story recently on her blog about meeting a stranger from Persia, which has stayed with me ever since. It's good to be reminded that simple acts of kindness are much more powerful on a personal level than anything the news can throw at us. Thanks Dee. Graduation during a recession means even the best laid plans can go off track. So in the early 1980's I found myself back at home with my parents instead of forging the glittering career I'd anticipated by being the first in my family to study at university. The work ethic is strong in our family, so I took whatever temporary jobs I could find to tide things over until my dozens of permanent job applications bore fruit. I never doubted that would happen, and finally it did, even though the result isn't quite the path I originally thought I'd take. Set up a Business Improvement District (BID) to promote your townInstall wi-fi in the centre of town and promotional flags at key entry pointsCreate a John Lewis-style video to promote local businesses for Christmas 2015Wait for a blogger to spot she can't embed the good news into her blogEt voila! I wanted to make this a good news story, I really did. There's much to applaud in an organisation dedicated to show the good things Chippenham has to offer. 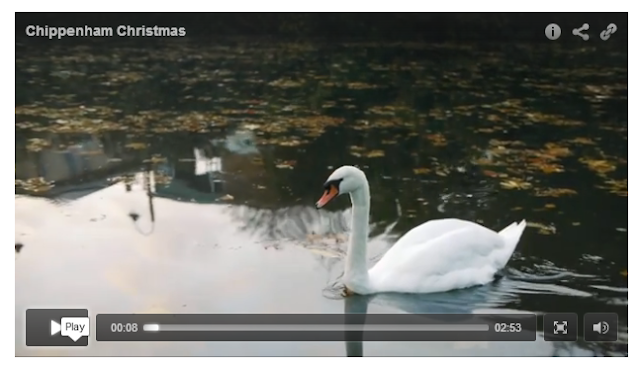 However, I can only give you a screen grab plus a link to our local paper's article about Chippenham's Christmas advert, rather than sharing it directly with you. NB it's worth a scroll down the article then a click on the video to have a look at the town at its best. Trying to outwit the spammers led to some amusing happenings in the past, but I didn't expect it to involve salad. After puzzling over word verification, sums over at Karen's, proving I'm not a robot etc etc., the latest innovation I found over at Happy Mouffetard's was possibly the trickiest yet. 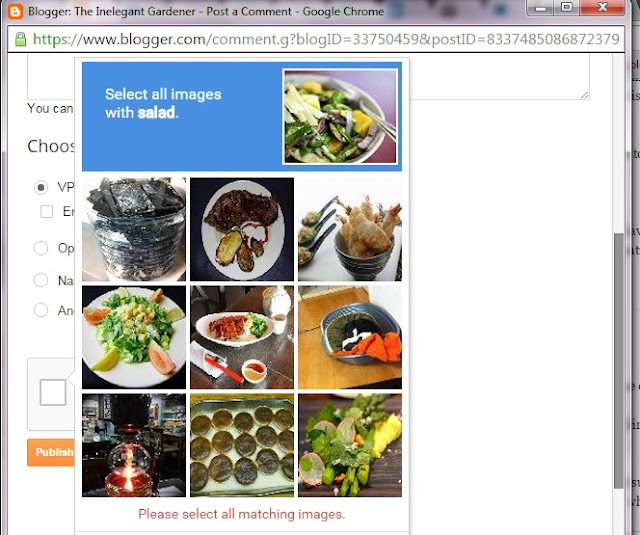 How many images with salad do you see in the picture above? I labelled this image 'Good Grief Google' at the time. Since then, I've seen its presence isn't confined to Google, but seems to be the latest CAPTCHA development on offer to anyone needing a spam prevention or similar service. My inner imp still giggles at the notion this might be a development in context-driven provision. For example, craft blogs could get pictures of knitting to sort out from other fabrics. I've grown Alstroemeria aka Peruvian lily for the first time, inspired by a bunch Victoria gave me around this time last year. They lasted for weeks in the vase and helped to brighten the dull days of autumn. In the spring I planted a bag of mixed tubers on my allotment to edge part of the big Woodblocx bed NAH installed for me last year. I'm pleased my mixed bag morphed into solely deep red flowers which are gracing my kitchen windowsill. Just four stems more than adequately fills a large vase. They came into flower in late June and by pulling the flowering stems when needed, they've continued to flower well into November. They're such good-value plants. Sarah Raven experimented with hers and managed to extend their flowering even more, though I don't know if that exhausted her tubers in the process. Do you have plants that wax and wane in your affections? That's how I've been with hellebores. They're one of the first plants I ever bought; some Christmas roseswhose crisp white blooms brought winter cheer to my first garden. They were fine for a while, but then they came down with the dreaded 'black spot', the bane of most hellebore growers. 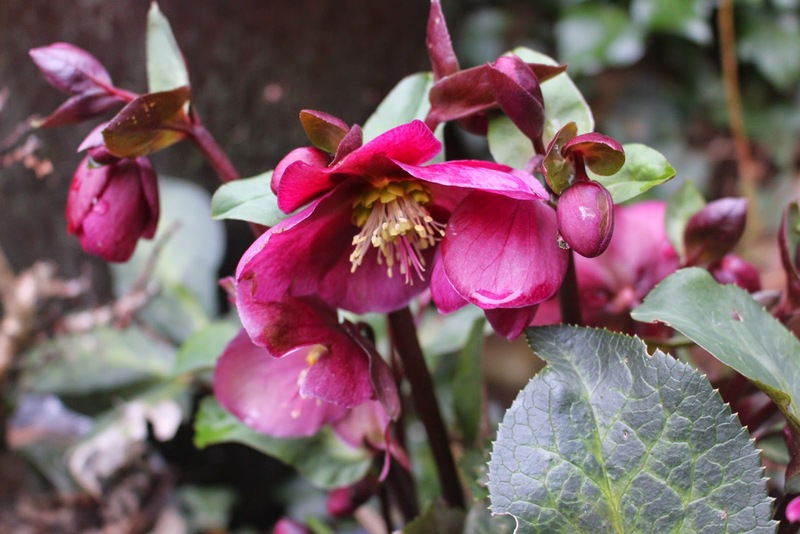 I briefly considered replacing them with some of the larger hellebores, but I was put off by their downward facing blooms and tendency to self-seed everywhere. Then a few years ago, I was smitten by H. x ericksmithii 'Winter Moonbeam' at an RHS London show. These have more upright blooms, - so much better for viewing them - with fantastic marbled foliage for year-round interest. They're also fabulous in pots. 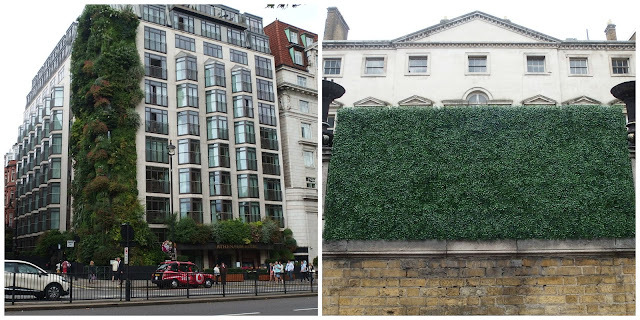 Back in the summer on a trip to London, I at last found some time to gawp at the Athenaeum Hotel's green wall. Designed and executed by that master of vertical gardens Patrick Blanc, it's a fantastic showstopper on Piccadilly. Imagine my surprise to find another green wall just a few doors down the road, using plastic greenery this time. You can decide which one's which in the above photo. It looked like the artificial one was being used to screen the building work being carried out on the former In and Out club aka Cambridge House. This was a private members club for officers and gentlemen of the armed forces which relocated to nearby St James's Square in 1999. The building lay empty for many years, which is surprising for a Grade I listed building in such a prime location. A blog I look after reached 100,000 Page Views recently, which was deemed worthy of a celebratory snippet in their company magazine. That blog has about 800 posts, each with an average of 200 words. After some light googling, I worked out that amounts to the equivalent of a couple of fiction novels, or around one weekday edition of the New York Times. Veg Plotting turns 8 today and I've published 2011 posts including this one. I'm twice as wordy here as I am on there, and if I take a few extras like Pages and captions into account, then we're looking at around one million words written so far. Phew. However, according to this blog post, I'm at the start of becoming a writer. I've enjoyed the ride so far and I hope you've enjoyed the read too. As my Irish ex-colleagues are fond of saying, "Thanks a million" for reading and all your comments so far. I couldn't have done it without you! I'm feeding our neighbours' cat this week, so I've had plenty of time to preview their pumpkin lanterns set out in the garden ready for Halloween. That got me thinking: if the nation's lantern innards were gathered together, they'd probably form a small mountain or three. How timely. World Vision contacted me this week with news of their Carve a Heart campaign, designed to create a gentler, more caring side to this year's Halloween shenanigans. Their pack includes a recipe for Moroccan Pumpkin Soup - a delicious way of using up those lantern leftovers, or in my case the solitary pumpkin harvested from my plot this year. As Julieanne wisely said on Twitter: "Pumpkins are for eating, not just for lanterns". These are tweaked slightly from the original recipe to fit with what I had to hand. The last day of our holiday saw us walking along St Ouen's Bay close to the site where Monday's Jersey Royals box is located. The tide was out, so there was plenty of beach to explore. I've added NAH to the scene to give a sense of scale. This view looks back towards the spot atop the cliffs where I took the picture postcard of the bay shown previously. I was keen to have a closer look at the vegetation to the right of the photo, which stood next to the farmer's fields. As I suspected, it's sea beet, an edible relative of chard and beetroot that's suitable for foraging. It was a new find for me and I saw plenty growing around the island during our stay. I wonder if it's ever harvested for the vegetable boxes? Young leaves can be used in salads, and it serves as a good substitute for spinach in any recipe. As you can see, it likes growing along the sea wall and in the shingle of St Ouen's Bay. One of my favourite sights on Jersey were these vegetable stalls at the side of the road. We found four of them, and this one was the first we discovered (at L'Etacq at dusk) and is also my favourite. It's the only one perched atop a wall (the rest relied solely on pallets) and I love how you can see the fields behind where the produce is grown, plus the clear light and the thin blue line which shows how close we are to the sea. Now you can see how the system works. The produce is refreshed at least once a day and relies on an honesty box for payment. The island is famed for its potatoes and the Jersey Royal now has Protected Designation of Origin (PDO) status, which means only potatoes grown and harvested on the island can be named as such*. There were a few bags of them for sale, alongside cabbage, kale, spinach, sweetcorn, courgettes, green beans and tomatoes. All are grown organically.